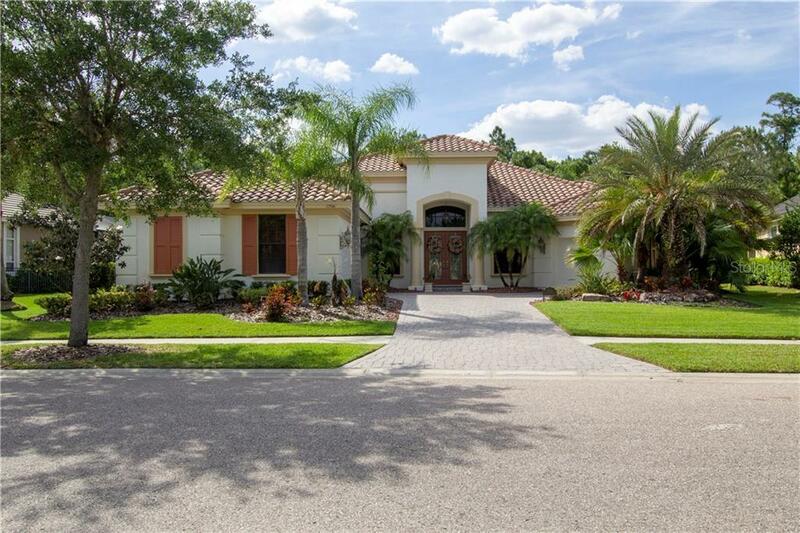 Stunning Arthur Rutenberg Executive home in one of Tampa's most desirable gated communities, Waterchase. Located in the Alicante section of Waterchase, this home features 4 bedrooms, 3 baths, Den, plus bonus room which can be a 5th bedroom, split 3 car garage, a beautiful outdoor kitchen and fireplace overlooking a sparkling blue Pool and Spa backing up to a wooded conservation area. Magnificent details throughout include Crown Molding, Designer Lighting, Plantation Shutters, Draperies, Tile and hardwood throughout. The large chef's kitchen features beautiful 42” cabinets, Wolf Gas Cooktop with Custom Range Hood, Decorative Tile Backsplash, Wolf Wall Oven, Microwave and Warming Tray, Sub-Zero Refrigerator, Island with built-in wine rack and eating area overlooking the tropical pool area. Large formal Dining & Living Rooms. The private Master Suite includes two walk-in closets with built-ins, a linen closet and a coffee bar with refrigerator. The palatial Master Bath features a large Roman 'walk-thru' shower with dual shower heads and a garden spa tub. The outdoor living space include's it's own fireplace, built in grill, multiple seating areas and large dining space. Enjoy resort style living with amenities that include two outdoor pools, two story water slide, 4 lighted tennis courts, basketball courts, large covered turf playground, multi-purpose field, fitness center and club house. Community also has a full time activities director that coordinates numerous social events for all ages.